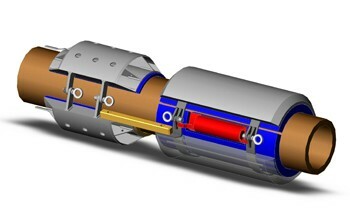 The diode-controlled cathodic protection system has been developed to prevent hydrogen embrittlement to high-strength stainless steels that require cathodic protection. Typical applications for the product are 13% Cr, 22% Cr duplex and 25% Cr duplex pipelines, however, the system is also suitable for application to high-strength carbon steel materials where low potentials from the CP system may be a problem. The system is installed as a part of the anode and no maintenance is required during the operational phase. Compared to a traditional design according to the NORSOK M-503 or the DNV-RP-B401 standards, the Diode-controlled Cathodic Protection system design will reduce the anode amount significantly. The system is based on a diode installed with the anode and the cathode. The diode shall ensure a sufficient potential drop between the anode and the cathode to avoid any risk for hydrogen embrittlement of the pipe material. It shall also be ensured that the potential is sufficiently low to avoid corrosion on the material. The diode package is a completely sealed unit that is designed for a maximum hydrostatic pressure of 260 bar. The materials in the unit have been selected to withstand corrosion at high seawater temperatures even without cathodic protection. For the design of the system, pipeline attenuation calculations combined with sensitivity considerations is applied together with traditional cathodic protection calculations. During the development of the system, extensive testing has been performed to find realistic current density data for buried pipelines operating at high temperatures. The results from this testing are applied in the design of the system to ensure an operating condition in accordance with the design calculation. 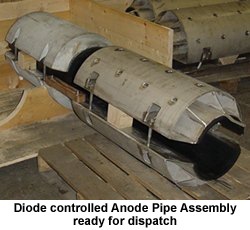 The Diodes are very reliable and have been through a rigorous testing programme so, unlike traditional diode systems which have reputation for failure during the early parts of service, these diodes have a probability of failure exceeding 1 in 20 million chance. The final product assembly is suitable for any situation in which lower controlled levels of potential are required. The configuration can be adjusted to suit pipeline bracelets or supplied with a shaped baseplate for flush fit for hulls or frames. Proven track record on 5 project successfully to date.